Ask your eco-question for a chance to win a year’s worth of Cascades products! Do you have questions about the environment that remain a mystery? Are you a responsible consumer who would love to win a year’s supply of Cascades products? 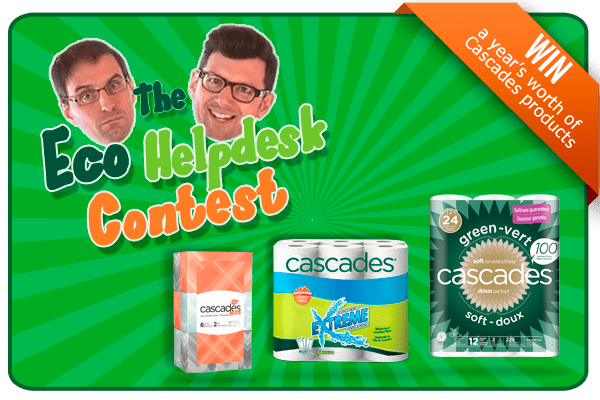 Enter the Eco Helpdesk Contest; it’s quick and easy! In addition to a year’s supply of Cascades products, the winning question will be answered by Jean-Sébastien and Frédéric, our helpdesk experts, in a video clip to appear on Cascades’ Facebook page on April 22! Click on the following link and ask your eco-question: http://bit.ly/ecohelpdesk.